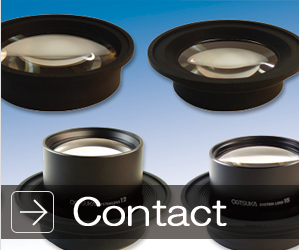 Frequently asked questions | Otsuka Optics Co., Ltd. The following are frequently asked questions and the answers to them. If you have any other questions, please ask by e-mail through “Contact”. 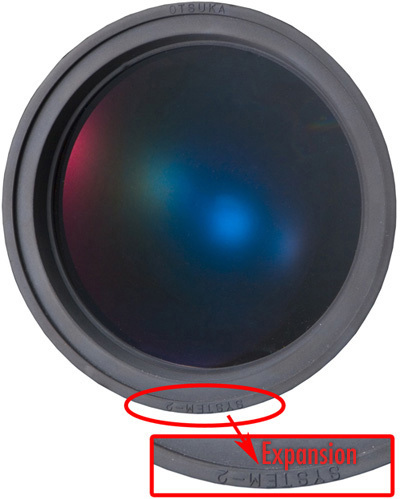 The magnification of 2X, 3X, 4X, or 6X is displayed as in the red circle in the image. The magnification of 8X, 10X, 12X, or 15X is indicated on the seal stuck to the lens holding metal cylinder installed to the lens. ※The magnification is indicated basically as shown above. However, the above rule does not apply to some former models, and some lenses cannot be exchanged.In that case, please call us. It is not available for oversea market. Q：I am worried about the heat from the lamp housing during work/inspection. If a magnifier uses a fluorescent lamp as a light source, then a current flows constantly through the filament to heat the filament while the lamp is turned on. Accordingly, the fluorescent lamp keeps at high temperature, regardless of the dimming. The heat of the filament transmits to the metallic lamp housing, which radiates the heat around it. You may be worried about the radiant heat, depending on the using condition, etc. ･ The LED element generates less heat than the fluorescent lamp, thus relatively less heat is radiated from the lamp housing. ･ Since the generated heat quantity is in proportion with the light quantity, the generated heat quantity decreases if the light quantity is reduced with the light control function. For the above reason, a thermal problem may be solved. We have prepared demonstration products of all models of LSK Wide Series. We strongly recommend you to try them. LSK Wide Series can use only φ150 wide interchangeable lens system 2X, 3X, and 4X. Q：What is the reason for adjusting the lighting? Because the distance between the light source and the subject of inspection is short with respect to the light magnifier, reflective objects would reflect excessive light rays, thereby causing eye fatigue. In such cases, you can adjust the light intensity to achieve the optimum intensity of illumination. We have two types of products, one with the light intensity adjustment feature and one without. Please choose according to your needs. Q：What is the difference between Type F and Type CF? The difference between these two models is the length of the arm. The lengths are 1,000 mm for Type F and 680 mm for Type CF. They share all other features. Please choose according to your working environment (setting space). Q：Is it possible to mount the lens from the light magnifier we are currently using, on a new product?